I’ve spent a fair amount of time recently getting up to speed with SharePoint 2010. 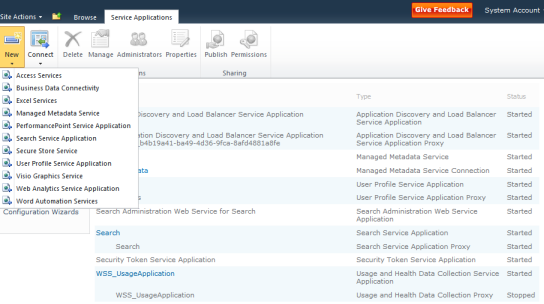 One of the features that surprised me the most is the new Service Applications framework. TechNet defines Service applications as “a resource that can be shared across sites within a farm or, in some cases, across multiple farms.” Previously resources were shared between sites using the Shared Service Provider (SSP) model. The SSP model worked fairly well with simple deployments but little information was available for complicated distributed deployments which led to a lot of frustration. In addition, one of the big complaints was that the SSP was only available for MOSS versions and was not available for WSS. The Service Applications framework has been built directly into Foundation services which makes it available to all flavors of SharePoint. SharePoint Server 2010 ships with services for all of the main MS Office apps, Search, User Profiles, Managed Meta-Data, Performance Point, and BCS. Not only can you define which applications are configured, but you can manage the associations so that the applications can be exposed to specific SharePoint web applications. Since it is possible to deploy the same service multiple times you can support different configurations and authentication models to support more complex deployments. In addition there are situations where you can use FAST search on some applications and regular Search on others in the same farm. There are an unlimited number of deployment possibilities. Since the framework is open this provides real opportunities to the ISVs in areas like vertical applications in just about every area. Some of the ECM and BPM vendors have been heavily integrated with SharePoint for years so I think this can only make their offerings that much more powerful. Another advantage to the modular approach is that it is possible to for both Microsoft and the ISVs to provide new services or service versions outside of the typical long release cycle. I’m hopeful that this will enable some of the currently evolving technologies and features to catch up. In some recent articles I outlined some considerations for Site Topology Planning [Article 1, Article 2]. In addition to segmenting the applications and sites therein, you will also want to start to draw out the service associations as well. For example you can determine how many search or user profile providers do you need. All of this segmentation does has a potentially negative side effect. Each of these services has its own database and potentially its own IIS Application Pool, which best practice dictates has its own dedicated domain account. It is easy to see how the number of accounts, application pools and databases would get out of hand. This was a common complaint I heard in many smaller environments with MOSS, and it is exponentially worse with 2010. In my opinion the new model has many more advantages than disadvantages. I will not let a few extra databases and accounts influence my application and service association decisions. The Service Application model in SharePoint 2010 offers up a lot of flexibility and expandability allowing implementers to tailor the deployment to the specific business needs. I encourage everyone to evaluate the new model thoroughly before making any upgrade or migration plans in order to maximize the value of the new services. I’ll be giving a presentation on SharePoint Disaster Recovery at the Triangle SharePoint User Group’s February 2nd meeting. During the presentation I’ll give an overview of SharePoint Disaster Recovery including identifying where things are stored, different approaches and tools for performing back ups and how to recover from a couple of common disaster situations within different types of SharePoint farms. I hope to provide plenty of time for Q&A;, but if you have any specific scenarios or questions you would like covered please drop me a note. The Triangle SharePoint User Group meets the first Tuesday evening of every month on a variety of SharePoint topics that range from IT Pro to Development deep dives. The group currently meets at Tek Systems Raleigh Offices. If you are in the area and interested in participating please register for updates. You can also get updates on twitter by following @trispug. This article will cover some techniques that I typically use for troubleshooting performance issues when loading a particular page in SharePoint. Troubleshooting the overall platform and member servers are outside the scope of this article. On occasion I have run into situations where a specific page or collection of pages take longer than expected to load. I say longer than expected because everything is relative to your content, user activity and your underlying server architecture. If most pages load in under 10 seconds, but one in particular takes 30-40 seconds or consistently times out then there is clearly something that needs to be reviewed. The first place I start is by reviewing the actual SharePoint page(s) having the trouble. It is possible, and somewhat common, to have content on a given page that is not displayed. It is possible to have hidden web parts on the page, and while there are some valid reasons for this, in most cases it is done by mistake. Some users do not understand the difference between the Close and Delete option in the web part menu. Close will essentially hide the web part, Delete will actually remove it from the page. Since in both cases it is no longer displayed, most do not think anything more about it after it is gone. That content is still being loaded even if it is not being displayed. I have seen a few instances were multiple instances of a large lists are being loaded in this manner which slowed the page load down by 20+ seconds. To check for this through the browser, add “?contents=1” to the end of the URL. This will redirect you to the Web Part Maintenance page displayed below. From there you can remove the Web Part by selecting the checkbox and clicking the Delete button. If you want to restore it, return to the page go into Edit Mode and select the Add a Web Part button. For sites with Publishing Features you will then need to go into the Advanced Web Part gallery options to see the regular Web Part menu. 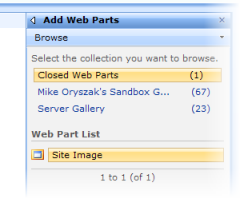 Select the “Closed Web Parts” gallery listed at the top and add it back to the appropriate zone on the page. Check to see if Audiences are being used. While this may be a very useful feature in some instances, it can also be inappropriately used. Just like the Closed web parts mentioned above, this content will load for everyone, but it is only displayed for people in the appropriate audience. It is a good idea to try and avoid this on top level or heavily trafficked pages. I’ll then use a tool like Fiddler which is able to track all of the network requests from the client computer to the servers. It is important to note that when running this you will want to close out any other applications that might be making network requests. Things like your email client or even apps like the Google Toolbar can be pretty chatty and make the results a little harder to read. Fiddler will let you now exactly how long it takes to load the page, and break down each and every resource that is also loaded in order to render the page. From the trace results, take note of where the requested resources are located. If everything is being requested from the same server it should be pretty straightforward, but in some cases there may be images, styles, scripts, or other resources referenced on other servers. Review each of the sources and see if there are any connectivity issues with that particular server. If any of those servers are outside of your network it may be even harder to have consistent page load times. In some cases it might be possible to relocate some of those resources closer to the application. Images, styles, and scripts that are frequently used, but that do not change very often are good candidates for that. This is also a great tool for determining what is and what is not being cached. During SharePoint design or branding projects it is a good idea to clear your browser cache and compare the first request versus a subsequent request where images and related resources are cached. In some cases new or infrequent users may be having trouble getting resources to load that regular users already have cached. Hopefully these tips will help you isolate ay performance problems and bottlenecks in order to keep your page load times as quick as possible. In the previous article SharePoint Site Topology Planning I discussed some of the technical implications of organizing the the sites within one or more applications, site collections, and sub-sites. The article started to get pretty long so I decided to save the taxonomy part of the discussion for a separate article. In the previous article I addressed different types of content and using that to help segment the sites across applications and site collections. Within a given application it is possible to provide some meaningful segmentation by configuring managed paths. Most people understand hierarchies, and most businesses (at least in the west) have been organized in hierarchies for many years. It is natural for people to think of their organization in this manner, but this may not be the best way to plan for the topology of your sites. Traditional Intranets tend to go from the largest organizational unit down to the smallest. There may be multiple divisions, with multiple business units, with multiple departments, with multiple teams, with people that actually do the work. Sites or portals that go 5 or more levels deep can become very difficult to manage and even harder to use. Modern businesses need to remain agile with teams always being redefined, combined and split up. In most situations it is a good idea to fight the hierarchy tendencies and strive for a flatter structure. From a SharePoint perspective a flatter structure with more site collections will make it easier to reorganize sites and structure versus a single site collection with 5+ sub-site layers deep. As previously discussed Site Collections can be backed up and restored with a high level of fidelity (completeness) compared to a sub-site’s export and import options. The key to usability and manageability is to find the right amount of segmentation and site collection structure. An alternative to a rigid hierarchy is adopting flexible taxonomies with tagging. Tagging provides a flexible and dynamic method of describing the content and sites that can evolve over time. A great example of this is a site like StackOverflow compared with the rigid structure of the MSDN/TechNet Forums. The flat structure decreases the chance of duplication and provides new opportunities to view the data in new and unique ways. The SharePoint 2010 system full supports tagging without the need for custom or third party add-on components. I fully expect that these will be a popular feature within the new version. Following the guidance between the two articles you should be able to properly plan your site topology. Assumptions and business decisions do change, but if you establish the right level of granularity with applications and site collections you will be able to migrate and relocate things as needed. This is the next in a series of articles addressing core SharePoint implementation topics. I hope that this is valuable to both groups looking to implement SharePoint for the first time as well as groups planning planning for an upgrade or migration to SharePoint 2010. Farm – In the context of this article, all of the Applications, Site Collections, and Sites hosted by one or more connected SharePoint servers. I say “connected” because it is possible, and fairly likely that most organizations will have more than one Farm (Dev, Staging, Production for things like Intranet, Extranet, Internet, etc). A farm has one or more content Applications plus additional applications for things like Central Administration. Application – An application would be the top level address which maps to an application in IIS. For example http://sharepoint. An application has one or more Site Collections. The application level is also the level where you have the opportunity to identify one or more content databases for storing the content on the SQL server. Site Collection – A site collection has one or more Sites also referred to as Webs or Sub-Sites. Sub-Sites or Webs – This is the smallest container which resides under and can be managed by the Site Collection. The first step is identify what types of content or site(s) you expect to host. Not all of those types of content apply to every organization, but it should be pretty clear that the content, the update frequency and the manner in which it is used and managed can vary quite a bit from type to type. Very small companies or workgroups may be able to get by with all of the types of content hosted in a single Application, but for anything larger there should be plans to segment it to multiple Applications in the farm. Authentication Model – What type of authorization model will be used? Options include Anonymous, Windows Integration (NTLM or Kerberos), and Forms Based Authentication (FBA). Since an Application can only support a single authorization mode, that can dictate additional applications. Edit: Anders Rask was kind enough to point out some changes to the authorization model in 2010 that make the previous statements incorrect. In 2007: Options include Anonymous, Windows Integration (NTLM or Kerberos), and Forms Based Authentication (FBA). Since an Application can only support a single authorization mode, that can dictate additional applications. In 2010: There are two high level options; Classic which supports Windows Authentication only and Claims Based which supports one or more different providers. Additional information can be found on TechNet’s article Plan Authentication Methods. Sessions – When a user visits an application a session is created. It is important to understand that their session is for a specific IIS Application so if they visit the main company portal and then click to see the MySite they may be asked to authenticate again. With Anonymous this should not be an issue. With Windows Integrated this should not be an issue if 1) users are using Internet Explorer 2) they access the site(s) with the same account they use to access their computer and 3) their browser is properly configured to pass logged on user information. Application Scoped Solutions – Solutions can be scoped to specific Applications which can provide some flexibility in deploying new features. In a large environment it is important to only show features to the areas where they apply. Amount of Data – It is important to keep your site collections at a maintainable level. There is no hard limit, but as Site Collections grow over 40GB they can get more difficult to maintain and will take longer to restore. SQL Server tuning becomes more critical with larger databases. It is a good idea to segment your content across multiple site collections (and across multiple content databases) in a manner that makes sense. SharePoint Groups – SharePoint Groups can be a good way to organize users, especially when they do not map to functional areas or groups otherwise managed in Active Directory. These groups are defined and contained within a given Site Collection which means if you want to use them in multiple site collections they have to be duplicated and maintained separately which can be problematic. Site Collection Administrator – A site collection administrator has great power and control within the site collection container. A Site Collection administrator can choose themes, manage all security within the site collection, manage activated solutions and potentially deploy other customizations if policy permits. Enabling content owners should be a top priority, and the Site Collection provides a good container for that. Quota Management – Quotas are set at the Site Collection level so if granular quota management is required for billing or charge back purposes it may have some impact on how site collections are segmented. Navigation – The default SharePoint navigation provider does not span site collections (and therefore applications) which can make a standardized or unified navigation scheme difficult to maintain. This tends to work fine for team collaboration sites, but can be cumbersome when you need to link many site collections. Content Types – I think Content Types were one of the most important changes introduced with WSS 3.0 and MOSS. An entire overview of content types is outside the scope of this article, but keep in mind that within the current release Content Types are created and maintained within a Site Collection. If a Content Type applies to multiple site collections then it needs to be duplicated. SharePoint 2010 will support farm level content types which will remove the need to duplicate them. Profiles (WSS Only) – If you are using WSS it is important to understand that the profiles are stored at the Site Collection level. If you add custom attributes they will need to be added to all site collections they apply to. There are a few different methods to backup and recover SharePoint content. Within the context of this article it is important to understand the difference between the commands that stsadm provides. Site Collection Backup and Restore – Considering the boundaries previously discussed, there is a lot of extra content stored in the top level site of a site collection. Doing an stsadm backup will provide a high fidelity snapshot of the content, configuration, workflows, and other customizations. It is important to note that if you are moving the site collection between applications or farms that you will need to install any solutions or dependencies referenced in the current location. Sub-Site or Web Export and Import – The Export process offered for Sub-Sites is great for archiving, but it does not provide the fidelity needed to move sites around. It will not save workflow, features, solutions or alerts. I’ve also had inconsistent results with DataViews on sites being migrated in this manner. If you think you will need to migrate the content or want flexibility, it would be in your best interest to consider using more Site Collections rather than deeply nested Sub-Sites. The purpose and content within a site collection or site can evolve over time. Some sites that started very narrow in purpose may change and now warrant their own Site Collection or Application. When preparing for a migration or upgrade it is a good time to run through this exercise again to validate the assumptions and decisions that were previously made or overlooked. While it may make the move more difficult the changes will pay dividends over the coming years offering a system better tuned to the user’s needs and more maintainable by the site owners and farm administrators. This weekend is the one year anniversary of SharePoint Saturday which kicked off in Virginia Beach, VA last January. I’m not sure what Michael Lotter and the other originators were thinking when they put it together, but surely it has surpassed their wildest imaginations. There were at my count, 27 events last year. That is amazing given that this was a new idea and is a volunteer based, community driven activity. None of the organizers or speakers are paid and yet great content is delivered to the interested participants around the globe. If you have not attended one yet, I highly recommend it. Stay tuned and support your local SharePoint community! I would like to close with a Thank You to all of the organizers, speakers, volunteers, attendees, and sponsors that have made SharePoint Saturday possible. For anyone in the central North Carolina area, there is going to be a SharePoint Tweetup / SharePint on Wednesday January 6th at 6:30PM at Danny’s BBQ in Morrisville, NC. SharePoint Joel will be passing through on a cross-country bbq tour and meeting up with some of the local SharePoint people. Looks like we should have a good turnout with some great company. It is pretty informal, if you are available come on out.